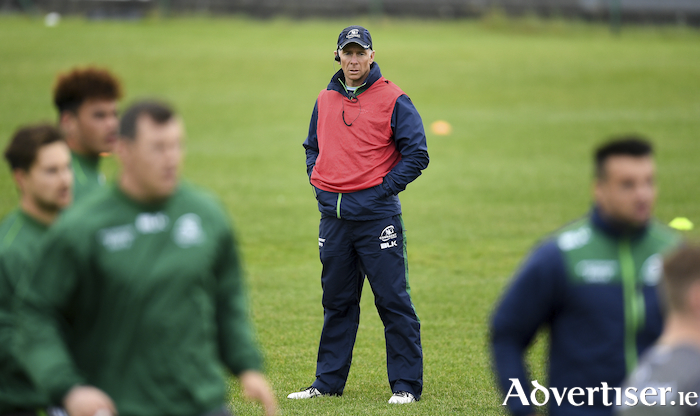 Historical baggage can be incentive or curse, or as Connacht coach Andy Friend now believes, it should be ignored. Not since 1960 have Connacht taken down Ulster in Ravenhill, and in recent years it has increasingly become both burden and bait. Pat Lam would dearly have loved to have ticked that box during his successful tenure, but failed; Kieran Keane made history with three wins against the provinces in one season, but not away from home; and now Friend is taking a new stance - let's just not talk about it. So when Connacht face Dan McFarland's Ulster in Kingspan Stadium tomorrow evening (7.35pm ), Andy Friend wants his squad unburdened by history. It is simply another game, another interprovincial, and another opportunity. Given that not-to-be-talked-about historical fact, Connacht will not favourites, and they now face an Ulster side stinging from a 64-7 loss to Munster. It is a script not too dissimiliar to last season after Ulster suffered a rare defeat to Zebre in Italy, and the home side eked out a 16-8 victory thanks to Jacob Stockdale. However there is also a vulnerability which Connacht must exploit, and Friend believes it is possible if his side produces the "clinical" edge - the theme of this week, according to Friend. "Ulster are off the back of a performance we know they will be upset about, and they are going out to right that wrong, but I know if we take the little learnings from the Leinster game and the same energy, if not a little more, and turn up there, we are going to give a really good account of ourselves. "We know, if we are not clinical, discipline wise, our skillset, our communication, and doing the simple things right, then we are going to get hurt, so our focus this week is about being clinical in our performance. Both teams are coming off six-day turnarounds, both teams, if you want to find reasons not to be energetic, you could, but to me it's the team that is mentally tough enough to deliver an real intensive 80 minute performance that will get the win." Friend, who makes his first visit to Kingspan Stadium, says he is looking forward not back. "We are not looking at the last 50 years. We are saying we have a brilliant chance to go to Belfast on Friday night and take on what is going to be a really fired-up Ulster team given the result last weekend, and the fact they are in front of a home crowd that we know is passionate, and we know they have a proud record there. "So it is a great opportunity for us. Let's do what we have to do, and after that we can talk about whether we made history or didn't make history. "I reckon in the last 58 years there's probably been 58 occasions when they have talked about that, and it hasn't worked. So I thought bugger that, we will break the trend, and we haven't talked about it. When we win, we will talk about it, without a doubt. "We haven't spoken to the boys about it at all. We have spoken as a coaching staff, and its like 'same old same old, let's not talk about', so we haven't." Having huffed and puffed against Leinster, but having failed to make it count on the scoreboard, a key for Connacht tomorrow night is the ability to capitalise on chances created. "Away from home and in interpros, you are not going to get many chances, and we probably had a couple of chances against Leinster, and that can be the difference in a game. So tomorrow night, if there's an opportunity, we have to take it. If we are the team with that ruthless and clincial desire, then we have a fair chance of winning it. Ulster will be boosted by the return of Rory Best, Stockdale and Sean Reidy from injury, while John Cooney is likley to be fit. Friend expects to have captain Jarrad Butler and wing Matt Healy back. "We are conscious of trying to rotate certain players and look after certain players, and we have done that well over the last couple of weeks - Paul Boyle two weeks ago, Jarrad Butler last week, and Matt Healy, so we are managing those blokes and hopefully all three will be available this weekend, and they will be better for that little rest." "It's a very attritional competition, it's full one so you need depth in squad, you need the numbers there. At the momebnt we have the Celtic Cup running which is brilliant for the Academy and next tier players, but it stretches you. It means we have two games going every weekend for six weeks. It's great and it is what we want, but when you cop a few knocks in certain areas, it stretches you, and honestly I am seeing this squad grow because they are having to grow."